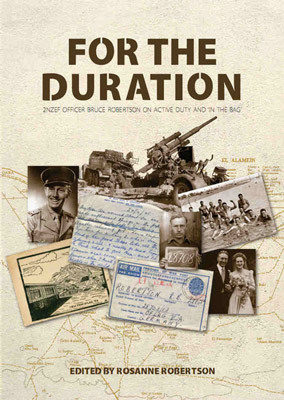 Roland Bruce Robertson left Wellington in January 1940 for the Middle East, with the first echelon of volunteers. He served in Egypt, Libya and Syria and after a night of hell on the Alamein Line in July 1942, he became a prisoner of war. He endured prison camps in Italy and Germany before being liberated by the Americans in April 1945. For the Duration is largely transcribed from Bruce’s comprehensive journals and diaries. It paints a vivid picture of one man’s war: a fascination with Middle Eastern culture, the blistering Western Desert, furious battle and the shattering blow of capture. And how using a talent helped him make the best of it as the Allies advanced into Germany and the war drew to a dramatic climax. One of our more detailed and perceptive personal accounts of Kiwi war service, from both active service and POW points of view. Last update 17-10-2011 by © Team Moosburg Online (E-Mail) - All rights reserved!